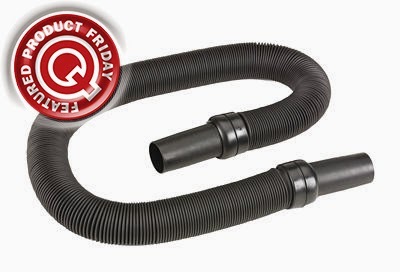 Save 14% off the MSRP on 3M’s 10’ Vacuum Hose Assembly (MFG Part Number: SV-SH32) when you use our FPF031414 Coupon Code. This Featured Product Friday (FPF) promo is valid from today, March 14, 2014 through Sunday, March 16, 2014. The 3M SV-SH32 Vacuum Hose Assembly (Q Source SKU: S036-001050) is for use with 3M’s Model 497AJM & Model 497ABF Electronics Vacuums. The Hose Assembly is 32" and stretches to 10' in length. Regularly listed at $31.51, but with our FPF code savings you’ll get it for just $27.00 (a savings of $4.51). While this is a 3-day limited-time price, the coupon is unlimited. Use the code as many times as you like while it is valid—and please feel free to share the code with your friends & colleagues, too. Please note: This promo is valid only at QSource.com.